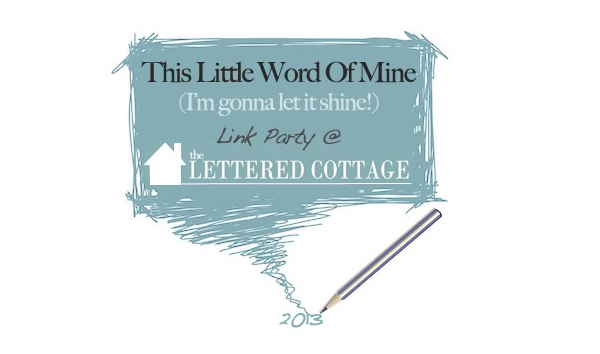 I woke up thinking about my Word Of The Year, which made me wonder how you and your Word Of The Year were doing, and all of a sudden it hit me: We should have a “This Little Word Of Mine” link party this week!! We threw one here last year, and man was it a pretty/powerful party! Thanks so much for partyin’ with us again, and hope your 2013 ROCKS! Love it! Happy New Year Layla and Kevin!!! My word for the year of 2013 will be “forgiveness”. I’m not ready to “go there yet”……….but it will be something I work on during the year. I might just have to work on me, first, and then try to forgive the 2 women who have caused me such grief and pain. I know……………….”Let Go – Let God”. Thanks for the Linky party Layla! I think my word would have to be courageous. I spent a lot of 2012 fearful because of situations that were out of my control. Deut 31:6 helped me understand that I can not be afraid because of man – God will never leave me. He has it all under control. Thanks Layla! i wasn’t planning on having a word(ever? ), but one sorta chose me this year. can’t wait to check out these links this week! xo happy new year, cuties! Happy 2013 to you both!! That was my first linky party I ever signed up for! Thanks! I don’t have a post ready to link up but I have thought about it and know what my word will be. Hopefully within the next week I can get my act together and share. 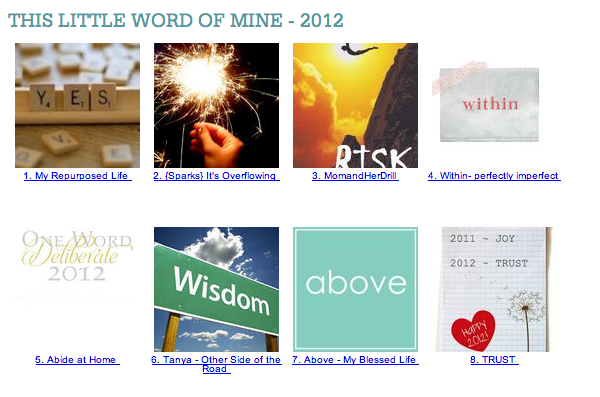 Love the link ups for One Word for 2013!! Awesome, inspiring and encouraging!! Happy New Year and thanks for letting me share my word(s)!!! Wishing you only good things in 2013! Great idea for a link party and a good way to kick off a new year! Thanks for the inspiration!! This is my first year even knowing about “word of the year” so thanks for the inspiration! Such a great idea for a party! Just when I chose a “word of the year” for the first time! Wishing you the best for the year to come! So fun!!!!! thanks for the great opportunity!!!! New at this linky business, why do I get a little red x and everyone else has a pretty blue line!?! Please help me!!! Oh, that’s just so you can delete it if you want to Lori. 🙂 None of us can see the red x! Huh, see? Total newbie question!! Thanks Layla!!! Layla, thank you for the encouragement to think about this! I’ve never been good at goals and resolutions, but choosing a word last year was a good thing for me. This year’s word is one I really need. I appreciate the chance to share it here. Happy, happy new year to you and Kevin and your precious child-to-be! Hi! Thanks for hosting. I managed to post our blog but the little button link didn’t show up on our page. I copied and pasted it into the bottom of the blog and now there’s just this really long code and no badge…which is not fair to you! Can you help? If not, I will edit the post and add a hyperlink to your page. Thanks! Thank you so much for hosting this Linky party. It has been so amazing to read through all of the participants words of the year. It’s amazing how just one word can focus in goals and change lives day-by-day. I love your blog and always find so much to inspire me. Thank you! I was so excited to see this, and wanted to link up, is it too late, I don’t see anything that says link by this date!